Bids for repairs to County Road H were expected to be opened Friday afternoon. 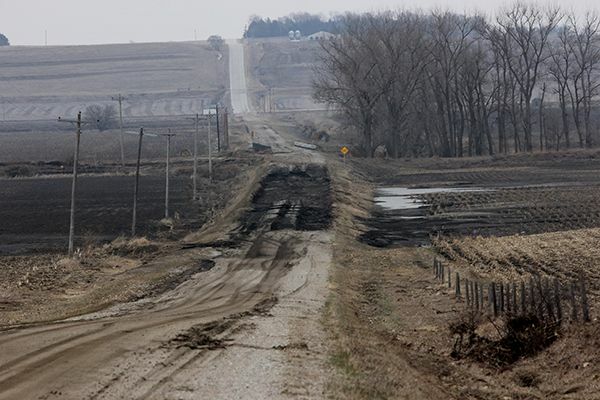 The road, located south of Oakland west of Highway 77, is one of two declared an emergency last week by the Burt County Board of Supervisors. The emergency status allows the county to waive normal bidding procedures for repairs. The board also named County Road L running west out of Oakland as an emergency. The headlines are gone and now we are here. Like with any disaster or tragedy, the spotlight is bright on the national stage during the event and shortly after. But when all the dramatic footage and dazzling attention-getting headlines are gone, that is when the real stories begin. During the tragic floods and crazy weather last month, Nebraska took a major blow – a straight uppercut right to the jaw. And now that the national publicity is over, we are getting up off the mat and are left with years of recovery. The Midwest Messenger has set up a relief fund to assist with rebuilding after the flood. Everyone has been very generous in their support. We launched our “Rising Above” campaign with shirts and hats proudly stating that we will not be held down because of this tragedy. While we were hit hard, we were very fortunate that the loss of life wasn’t epic. Our first responders, forecasters, public officials and our awesome military came together and directed people out of harm’s way. It really is amazing how everyone came together. If you would like to make a donation to the Rising Above Nebraska Relief Fund you can do it a couple ways. Check out the information on the Midwest Messenger webpage for more details: www.midwestmessenger.com/forms/nebraska_relief_2019. Checks can be mailed to a special account set up at Washington County Bank in Tekahmah, Nebraska. Mail a check to Nebraska Relief Fund, c/o Washington County Bank, P.O. Box 238, 303 S. 13th St., Takamah, NE 68061. If you need help, you are not alone and there is an army of Nebraskans ready to come to your side. All you have to do is ask or reach out. If you need some financial assistance with fencing, livestock feed, hay or other farm supplies, please send an email to mike.wood@Lee.net with information about your situation. The “Rising Above” relief fund is there for you. Just let us know what we can do and we will help in any way we can. A huge thank you to everyone who has participated and donated money. Share your story with #RebuildNebraska2019 or #RisingAbove. Mike is general manager of the Tri-State Neighbor. He serves as publisher of Midwest Messenger and other Lee Agri-Media publications. He lives in Tekamah, Nebraska. Reach him at mike.wood@lee.net.